Doesn’t it sound great? It’s been getting rave reviews pre-publication and I have a fabulous extract to share with you from chapter two. It’s long but well worth the read. Detective Sergeant Kay Hunter pulled the car in behind a white four-wheel drive vehicle emblazoned with the British Transport Police logos across its paintwork, and swallowed. A death on a railway was never easy to deal with, and she’d only had to attend a scene such as this once before in her career – a long time ago, when she was still a police constable. It was something she’d hoped she wouldn’t have to repeat. The phone call had come in as the team were starting to leave for the day, with a request from those at the scene to have two detectives attend. Details were scant, but the transport police had been at the scene for the past forty minutes, and the railway owners were keen to reopen the line as soon as possible. Now, Kay turned to the woman in the passenger seat next to her. 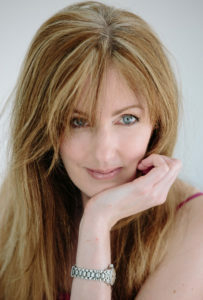 Detective Constable Carys Miles stared wide-eyed through the windscreen, her usually pale face a deathly shade of white. A motley collection of ambulances, buses and police vehicles were parked either side of the narrow country road. A uniformed officer stood at an open gate set within a hedgerow, directing attending services towards an unpaved track that led away from the lane and across a field. Floodlights created a pool of light the length of it, and as Kay followed the path with her eyes, she saw the train and its eight carriages of trapped commuters on the railway beyond. ‘Evening, Graham,’ said Kay, as she approached. Kay led the way along the track, careful to avoid the muddier parts of the field. ‘Is it common here?’ asked Carys, as she hurried to keep up. A man broke away from the group of police officers as they approached, his face shadowed by the angle of the floodlights. Kay glanced over her shoulder as one of the attending ambulances started to drive away across the field, bumping and jerking over the uneven ground towards a gate that had been opened on the far side. Carys emitted a groan and turned away. Kay walked side by side with Carys as they approached one of the patrol vehicles, the back door open. Inside, the figure of a diminutive, older woman sat huddled on the back seat, her eyes wide as she spoke to the police officer standing beside the vehicle, notebook in hand. A Border Collie sat at her feet, his ears attentive as she spoke, but sensed the two detectives approaching and twisted round to meet them, straining at his lead. Kay bent down to pat the dog on the head, then straightened and waited while the uniformed officer introduced them to Elsa Flanagan. The woman exhaled, a shaking breath that spoke volumes, and pulled the blanket tighter around her shoulders. Kay waited. The witness was processing her memories of the accident, and she had no wish to rush her. The poor woman was traumatised enough as it was. Kay straightened at Carys’s voice, and came face to face with a man in his seventies, his face ashen. The woman thrust the blanket aside as the dog spun round and launched himself at the man. The woman fell into the man’s arms, and his eyes met Kay’s. Kay watched as the older couple moved towards the floodlit track and then turned as Sergeant Walker approached. Kay and Carys followed him as he led the way towards a gap that had been severed in the fence line to allow the emergency services and investigating teams to access the railway tracks. A steady stream of disgruntled passengers was being discharged from the carriage at the far end, away from the carnage at the front of the train. ‘Where’s the driver?’ she asked as she pulled on the coveralls and plastic booties that were handed to her. Kay acknowledged Carys’s murmured comment as they approached the front of the train. Blood spatter covered the front wheels, a tangled mess of clothing and limbs strewn underneath. Kay checked over her shoulder. The first responders had erected shields at the start of the carriages, so none of the passengers would be able to see what was going on at the business end of the investigation. Kay greeted the head of the Crime Scene Investigation team and explained the known facts while the woman pulled a set of protective coveralls over her own clothes and tied her hair back. An astute and respected CSI, Harriet Baker had studied at Oxford before taking up residence in the Kent county town with her sales manager husband and had worked with Kay on a number of cases. Her face grim, she gestured to the photographer that joined her. ‘If we’re all ready, let’s take a quick look, and then I’m locking down this crime scene for processing. I’d prefer it if only one of you accompanied us,’ she said to Kay. Kay took one look at Carys’s pale face and wide eyes and knew she’d have to go. ‘Yes, Sarge,’ said the detective constable, the relief in her voice palpable before she scurried away. In reply, Walker wiggled the torch beam across the far rail. 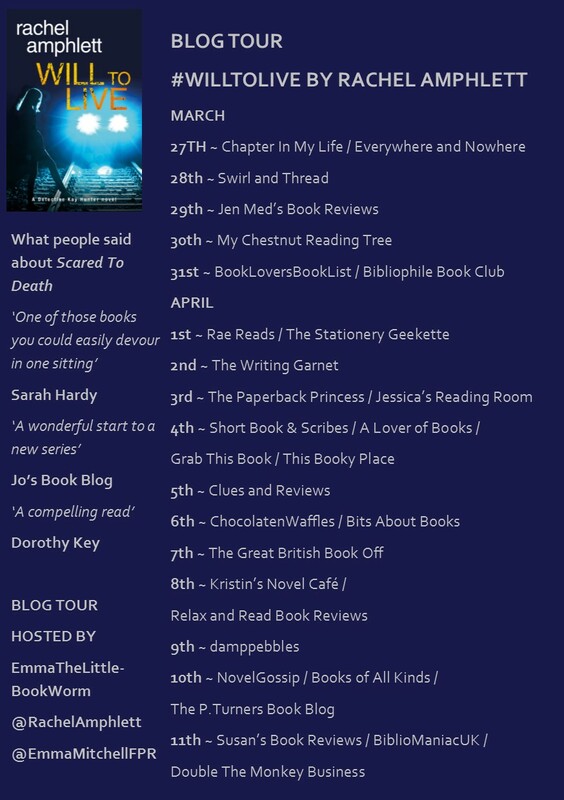 Many thanks to Emma the Little Bookworm for the place on the blog tour. There’s also a launch party on Facebook tonight – come and join in the fun and help Rachel celebrate. And even more excitement for you. There is a giveaway to win one of two ebooks. 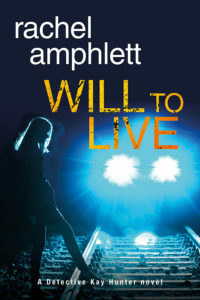 Author bio: Rachel Amphlett is the bestselling author of the Dan Taylor espionage novels and the new Detective Kay Hunter crime thriller series, as well as a number of standalone crime thrillers.